Mayor Bill de Blasio has a plan to fight President-elect Donald Trump''s promise to repeal Obamacare —Enroll as many as 50,000 New Yorkers in the plan over the next 12 months. LOWER EAST SIDE—Mayor Bill de Blasio has a plan to fight President-elect Donald Trump's promise to repeal Obamacare — enroll as many as 50,000 New Yorkers in the plan over the next 12 months. "We as New Yorkers need to fight back. And right now, one of the best ways to fight back is to sign up the maximum number of people for health insurance under the Affordable Care Act," de Blasio said Tuesday at a press conference at Gouverneur Health about a city effort to enroll as many people as possible before the Jan. 31 deadline. "The people who need help will say 'Why should I bother, it's going to be repealed?" said de Blasio. "One of the best ways to save it is to sign up." 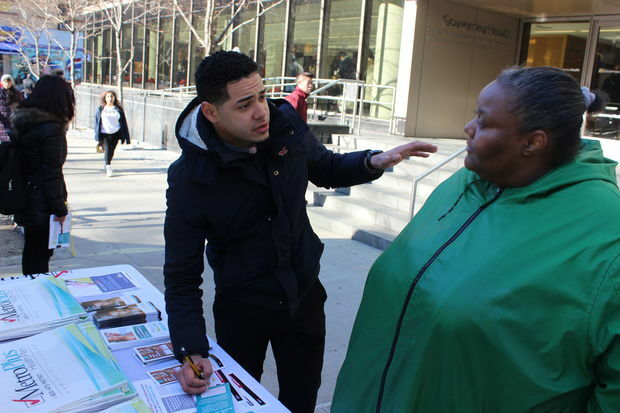 Erik Perez, a Medicare representative with MetroPlus gives someone information about signing up for Obamacare on in front of Gouverneur Health at 227 Madison St. on the Lower East Side. The 50,000 person goal over the next 12 months is 20,000 more than the city's original projected goal and comes with a campaign of door-knocking and outreach to people who have come into the city's hospitals for help without health insurance. Mobile vans and satellite sites at community centers and council members' offices will also have a specialist who will sign people up on the spot and shepherd them through the process. The city effort has reached 20,000 people so far and 1,000 people have signed up for appointments. If the city can reach its goal it could save up to $40 million on paying to cover uninsured New Yorkers. The NYC Health+Hospital corporation, which manages the city-run hospital system, is required to treat individuals whether or not they have insurance. The President-elect and Republican leaders have vowed to make the repeal of President Obama's signature initiative a top priority and repeal it immediately after Trump takes office. Trump has backtracked slightly and said he plans to keep some aspects of the plan such as requiring insurance companies to cover individuals in spite of pre-existing conditions. But de Blasio, who has been outspoken in saying that he will resist any Trump policy that harms the city, said signing up for Obamacare could make it more difficult to repeal. "The more and more Americans that sign up for ACA, the harder it is to take it away," said the mayor. Trump and Republican leaders have not said what they would replace Obamacare with. More than 20 million Americans rely on the Affordable Care Act to receive health coverage and many of those who supported Trump rely on the health insurance. That's why de Blasio said ultimately repealing Obamacare could become "real complicated, real quick for the Republicans" and Trump. "It gets a lot harder to keep these militant promises when you stare down reality," said de Blasio. The Affordable Care Act has made a big difference in how many New Yorkers have health coverage, said Health Commissioner Dr. Mary Bassett. 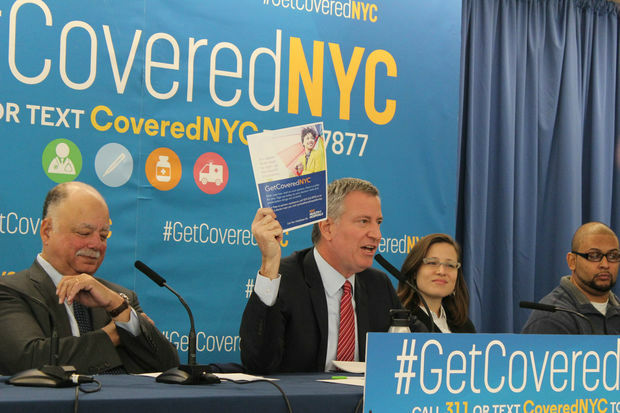 Since the health law passed, 1.6 million New Yorkers have signed up for care. The percentage of people in New York City who do not have health insurance dropped from 21 percent to 12.6 percent, said Bassett. Many of those who remain uninsured are likely undocumented immigrants who are not eligible for coverage, officials said. Councilman Corey Johnson, who is HIV positive, said he lost his insurance soon after being diagnosed with the virus several years ago. The difficulty of worrying about getting treated without insurance was difficult, said Johnson who criticized the proposal to repeal Obamacare. "What the Republicans and the President-elect are proposing is immoral," said Johnson who vowed to help make New York City the "epicenter of resistance" to the plan. Asked if the city had a contingency plan in place in case Obamacare is repealed, de Blasio said the focus right now is to fight to make sure the health insurance stays in place. The city would have time to come up with a plan if it is repealed, de Blasio said.